The driving force behind many RPGs today is the plot. In fact, to many gamers, the term "RPG" is synonymous with "superior plot", in that RPGs are more generally the most story-driven of all genres of electronic gaming. 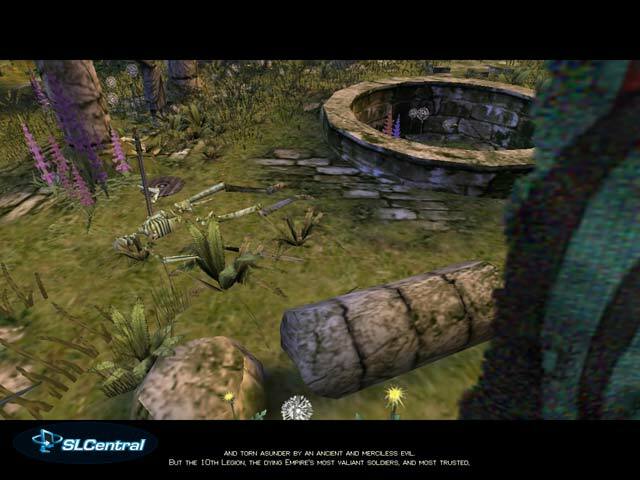 Dungeon Siege, on the whole, has elected to take a backseat to the standard plot development approach. In most cases, an RPG introduces a story to explain why your character is the savior of the world, and the cruxes which accompany your character throughout the span of the game. 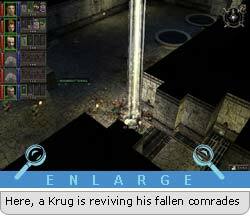 Dungeon Siege instead takes one fact for granted: The player knows that his character is destined to be the savior of the world. He doesn't need to rediscover that fact. Instead, Dungeon Siege casts a shadow of anonymity on your character, allowing you to fill shoes the size of your choice. From the beginning of the game, all you know is that your character is a simple farmer, looking to wreak vengeance upon the Krug, a race of vicious orc-like creatures that have decimated the countryside and killed all the local townsfolk. Your character has little purpose other than the vengeance he begins with, and the tasks that you choose to take upon yourself. The story (and a rather expansive one at that) is conveyed via conversations with people throughout the game, and a great number of books you'll find elsewhere. One note - I wish that the information from the books could have been compiled into your journal, for reading later after you've long since shed the book in favor of more loot. But, the primary point is that the game lets you choose your level of involvement. If you just want the action, you can skip past the cut scenes, ignore what all the NPCs say to you, and sell all the books you find. However, if you want to become more immersed in the world and the reasons for its demise, the game offers a wealth of information detailing the histories and tales of the cities of Ehb and the King's legionnaires, among many other things. You're also presented with many sidequests through the game, most of which you're under no obligation to complete, but they, like in a traditional pen-and-paper RPG, help to add background and development to your character, as well as lining your pockets. This leads into an interesting argument. In a recent interview in Computer Games Magazine (March 2001, Issue No. 124), Cindy Yans writes "Taylor does not believe in the type of 'Go forth and find this item and bring it back to me' activities in role-playing games. 'I don't like that,' says Taylor, 'I don't know if anybody likes it. Here you are, gearing up to save the world, and there's this woman in town insisting you go find her cat.' " On the surface, this is a perfectly reasonable claim - Inane sidequests can certainly get in the way of the fun and plot of an RPG. 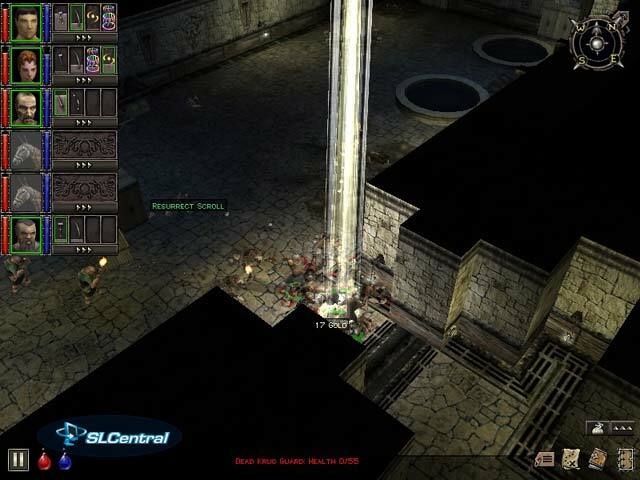 However, while Taylor makes some aspiring claims, Dungeon Siege ultimately gets saddled with the same sidequests - In Glacern, for instance, I was tasked with saving a young man's bacon by locating some books he'd lent out to friends that hadn't yet been returned. Granted, it was a very short sidequest, and one I could have easily overlooked�but it certainly qualifies as one of the same elements of the genre that Chris Taylor hoped to avoid.